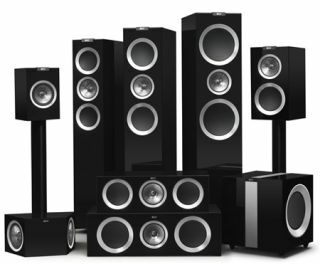 UPDATE: KEF announces UK prices for new R series speakers | What Hi-Fi? KEF has revealed UK prices for its new R series speakers which go on sale this month. The R range will sit above the Q series of speakers and below KEF's Reference range - the position currently occupied by the XQ line-up. As you can see from the group shot above, the KEF R range includes two standmount speakers, three floorstanders, a dipole surround option, a matching subwoofer and a choice of two centre speakers. The speakers look beautifully finished: alongside Rosewood and Walnut veneers there's a piano-black high-gloss finish (pictured). The two standmount options are the KEF R100 (pictured right) - a 28cm-high, two-way speaker - and the R300, which is a 38.5cm-tall, three-way design. Like every R series speaker, they feature aluminium tweeters and midrange/bass drivers, using KEF's Uni-Q driver array. The R series floorstanders are all three-way designs. The 1m-tall R500 packs a pair of 5.25in bass drivers, while the 1.1m high R700 (pictured below) has two 6in woofers and the range-topping R900 - standing 1.2m on its plinth - uses 8in drivers. The two centre speakers - the R200c and R600c – are 53- and 63cm wide designs, using 5.25in and 6.5in bass drivers respectively. The R800ds is a three-way dipole surround speaker option, while KEF R series is rounded out with the matching R400b subwoofer. The great-looking subwoofer – neatly finished with an aluminium 'belt' – packs 500W of class D amplification into its 36.5 x 33 x 35cm dimensions. The KEF R series makes its official British debut on 10 October, when we will bring you full details on UK pricing, plus more on the use of that Blade technology. Reviews to follow!